I edit and write documentation, tutorials, user guides, and more. This piece on the Mueller report. Because email wasn't enough of a pain. Like many others, I use the popular open source SSH client PuTTY. Today I learned it has been updated. The new version, 0.71, resolves several security issues. Once you download the update, run the file and go through the installation wizard. Any saved sessions should be preserved. I did have to unpin and then repin the #PuTTY shortcut to my Windows taskbar to get the program's icon to show again after updating. You can join PuTTY's mailing list to receive word of future updates. Firefox 66 has been released, and with the new version comes a most glorious feature: the blocking of autoplay content. This is a feature I have wanted forever, and am so happy it's now live. Now I can never leave Firefox. Update Firefox (select Menu > Help > About Firefox, then restart browser). Enter about:preferences#privacy in the address bar. Scroll to the Permissions section and then tick the check box for Block websites from automatically playing sound. This piece on facial recognition software. Automation coming for more jobs. This NPR photo essay on a Syracuse family. One of the benefits of following InfoSec Twitter and different tech sites is getting early word on data breaches, issues, products, and patches. Today I came across an article covering Intel's plea to install driver updates. Intel employees found eight of the 19 security flaws fixed in the updated Windows drivers. One was reported by a security researcher > who goes by the name @j00sean on Twitter, while the remainder were reported by an external Intel partner. All 19 flaws were tagged with CVE dates in 2018. However, fortunately > they all require an attacker to have local access to a machine to exploit them. Some of the updated drivers have been available for download for several months. Curious, I followed a link in the article to Intel's download page (which can also be accessed here). The site provides a tool to automatically update your drivers. Click the Get started button at the top of the page to download a small application. Run this once available. The tool scans your computer and identifies any outdated drivers. You'll then be prompted to download and install the updates. The entire process is finalizes with a system restart. It seems you can now choose DuckDuckGo as your default search engine. First became aware of this option via a Techcrunch piece from today. 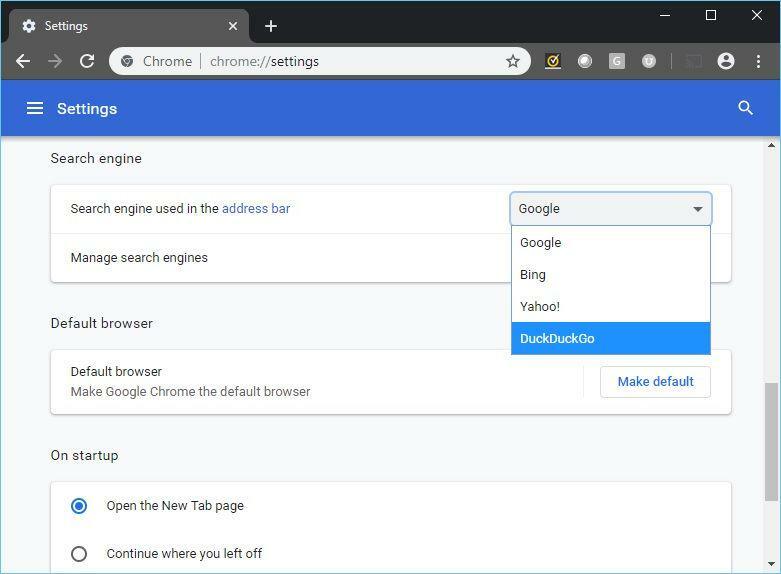 Enter chrome://settings/ in your address bar, scroll down to Search engine and select DuckDuckGo from the Search engine used in address bar drop-down. If you don't see this, update your browser to the latest version (73.0.3683.75) and then try again. First IE dominated, now Chrome. That said, a cool feature to enable in Firefox. Had to look up how spiders make silk to answer a question from my 6 year old. Lastly, my small Twitter thread on using Pop!_OS. Currently I am using different writing applications on different computers. I am finding that offline programs work better: write a bit, save, get busy with something else, write some more, save, get distracted, finish a draft, save, edit, then copy-paste into Write.as. My #Windows app of choice is MarkPad. I like how it provides a live preview pane of everything you enter so you adjust accordingly. My #Apple app of choice is uFocus. It's minimal, easy-to-use, and looks beautiful. I am still searching for a #Linux-based app for my Pop_OS laptop. Meanwhile I'm using the built-in text editor, which lets you work in #Markdown (among many other languages). I've yet to try a cross-platform app, but give it time. Tap and hold the app's icon, then tap Info. Tap Permissions. This will bring up the list of permissions. Tap the slider next to each permission to revoke it. The article does go on to say that changing the permissions can cause the app not to work as intended, and to delete any app with permissions that make you uncomfortable. Issues with free VPNs is apparently not new. Several articles detail how many free VPN apps originate in China, and there are concerns. A significant security flaw has been identified and patched for Google Chrome. Reports say it's already being exploited. Update your Chrome for Apple, Windows, and Linux immediately. Enter chrome://settings/help in the address bar. The update will download and install automatically. Select Relaunch when prompted to finalize. The updated version of Chrome is 72.0.3626.121. If you see this, you're all set.